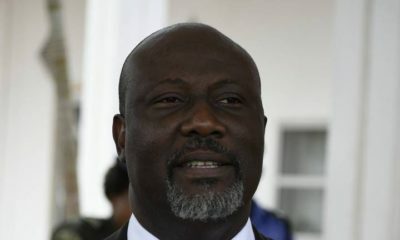 Senator representing Kogi West District Dino Melaye has been arrested at the Nnamdi Azikwe International Airport, Abuja. 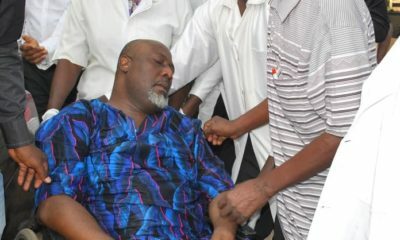 Melaye announced his arrest on Twitter, saying he was on his way out of the country when he was stopped by security agents. He was to attend an official engagement in Morocco sponsored by the Federal Government, he wrote. The police had also said he was placed on Interpol watchlist for allegedly providing false information in relation to an alleged attempt on his life in 2017. Ooje buruku. Ewon for where? 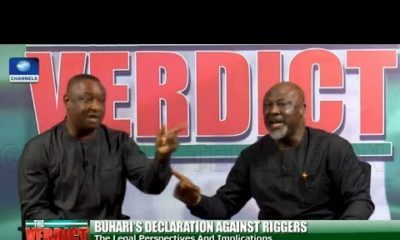 Nor bi Naija politics again?. They will beg him in the dark. Dino is a chick that cannot lay an egg but can break as many as it takes to take everyone down with him. I am indifferent towards him though. Watch alliances change as proper politiking starts. Buhari is on his way out. Even if NIS did not arrest him, the Fashion police would have. Warris he wearing? And in his mind he will be feeling fly o! Looking like Amadioha’s disciple going to visit a new client. Smh. This one is really the ‘Double Wahala’ of Nigerian Senate.